Do you want to liven up up your concrete? Do you want it to last? Do you need a splash of design? Are you tired of the same old? If yes, and I’m positive everyone said yes at least once, then check out the following options to put your personal stamp on your concrete. An epoxy floor appears and is applied like a paint, yet it is far more durable and protective. Solid colored epoxy floors are great in interior spaces. They make the area look clean, modern, and fresh. Epoxies are mostly used in outdoor areas, such as garages and warehouses. 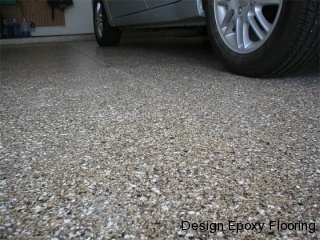 A multicolored flake is usually applied to give the floor more texture and depth. The flake is also good for hiding any dust, dirt, or imperfections. An acid stain is a great way to bring life to your concrete. Acids truly have their own unique design in mind. You can never truly predict how an acid stain will take and turn out before applying it. It reacts differently to each section of concrete and really brings the floor to life with different tones and depths. Acid stains are largely used in residential kitchens, bathrooms, and basements. Commercially, they are widely seen in restaurants, showrooms, gas stations, event centers, and other business locations. A sealer not only protects the concrete but it brings a modern look as well. Once applied, a sealer can make concrete look wet and fresh. Sealers are commonly applied in office areas and showrooms, making the area look alive and current. Also, sealers are always applied in conjunction with epoxies and acid stains to complement and protect their finishing. If your property is a new construction, being remodeled, or simply just needs a facelift, then give us a call today for a free concrete coating quote. We’d love to assist in revitalizing your space! Call us at (801) 769-6006. DEF is an adjective which describes a person, thing, or event of excellence and of beauty, and that is exactly what we do!